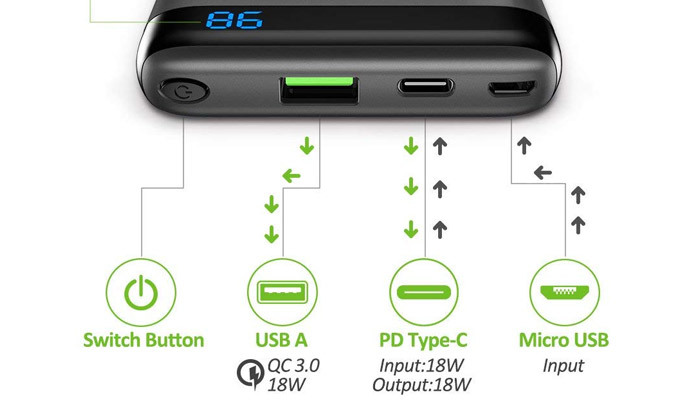 Powerbanks have come a long way in the last three years to keep up with every changing fast charge technologies we see in smartphones and now in laptops as well. The latest one we’ve got our hands-on is the 10,000mAh Omars USB Type-C PD & Quick Charge 3.0 ready. weighing in at 217g, it’s about the right size to throw in your bag and charge your smartphone fully twice. Perfect for weekends away or topping up after streaming too many love island episodes in the way to work. Since we’re dealing with a PowerBank, there are literally hundreds of competitors on Amazon. So the questions are? 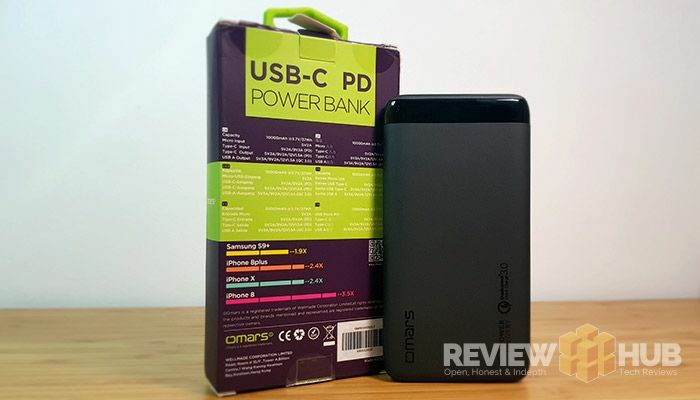 What separates the Omars 10000mAh Powerbank from the competition? And is it a done deal or one to avoid? Will charge USB Type-C Laptops / MacBook Pro. A Type-C to Type-C cable. As soon as I opened up the packaging and got hands-on with the Omars powerbank, I breathed a sigh of relief. There are no mould errors, the build materials (soft touch plastic) feels premium and space grey (more black) colouring looks the part. It uses a built-in clear blue LED display to let you know how much charge is left. It’s a nice feature when compared to the 4 flashing LED dots we see on any designs. Looking at the body, the only detailing we find is the glossy etched Omars logo and the Qualcomm 3.0 certification logo that subtly stand out against the matte grey body. Overall, for the low price-tag, you’re getting a premium powerbank that won’t scratch too easily when thrown into your bag every day. If I had to pick a point, Omars could have made it out of aluminium for that ‘ahhhhh cold to the touch’ feeling. But it’s a powerbank, not a smartphone, so I’d rather save a few quid and stick with the matte soft-touch plastic. Handily etched onto the back side of the Omars powerbank are the input / output charging amps and voltages which I’ve listed below. The QC3.0 certification means that it will fast charge any smartphone that uses the Qualcomm quick-charge method. This includes the Samsung Galaxy phones and most mid-to-high-end smartphones using a Snapdragon CPU. Charging up the Omars Powerbank is also much faster using the USB Type-C input rather than the micro-USB input. I’m not really sure why the Micro-USB cable exists as it’s Input (charging only), but it can’t hurt if you forget the included cable. 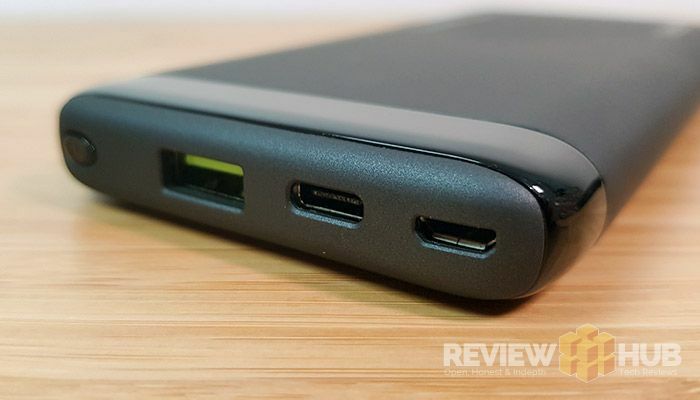 So what happens if I don’t have a Qualcomm Quick Charge enabled smartphone? You’ll still benefit from the faster amp charging, but it won’t be as fast as a QC2.0 or QC3.0 device. After 30 minutes charging, the Omars powerbank added +40% battery to the Samsung Galaxy S8. We tested using the included USB (full sized) to USB Type-C cable, and it speedily charged our MacBook Pro. We don’t have an iPhone here at Review Hub HQ to test (Android fanboys’n’all), but Omars promises a 1.5x faster charge time than the included Apple charger. At this price, you can’t go wrong with Omars 10000mAh Powerbank. The build quality is solid, the digital display helpful and it included the dual wire that’ll enable to charge all your devices at one. The charging tests showed that the Omars battery can easily fast your smartphone, tablet and even you USB Type-C laptop. I was surprised at how well it charged up the MacBook Pro during testing, even using the included cable. The versatile charging options mean that it’s useful for a whole host of gadgets. Could it get any better? Well maybe an aluminium shell and somewhere to store the wire, but these are wish-list tickets, not cons of the powerbank. Do we recommend the Omars Powerbank? It’s an easy Yes!